Anyone who has a pet knows they are considered part of the family. And this tendency to treat pets like people has never been more prevalent. Pet care brands are increasingly developing new products that are convergent with some of the leading trends in the food industry. Think: natural products containing superfoods and even chilled food offerings. Obviously, there are implications for the way that pet food is packaged. This trend also requires marketers to think differently about how to engage shoppers in retail environments both on- and offline. Below are 4 ways in which brands can use these trends to their advantage when considering packaging options. Whether they have children or not, pet owners are parents too. In fact, when it comes to the emotional reaction branding and packaging elicit, there are remarkable synergies between parents shopping for their children and owners buying for their pets. In both cases, the person shopping is not the end consumer. However, the inherent love they have for the end consumer means that health credentials are especially important, as well as knowing that the consumer will enjoy the product. Pampers’ famous UNICEF partnership provides a great example. It hits you right in the heart – emotive marketing at its best. As it happens, packaging design and print play an integral role in a campaign intended to connect on an emotional level. Demonstrating the health and nutritional benefits of pet food on labels and packaging is important. However, shoppers care just as much about whether or not their pets will like the food. To encourage trade-ups and switching brands, marketers in the pet food category are finding success with trial sizes and introductory offers. Consider partnering with ‘doggy day-care’ and premium kennels: these businesses can add value to their customers by offering a free trial opportunity for pets. Personalisation has been adopted by many consumer brands in recent years. The Coca-Cola Company’s ‘Share a Coke with …’ is one example. This is being replicated in the pet care sector by Tails.com, which creates tailor-made food for individual dogs. How it works? Based on 9 simple questions, Tails.com allows you to input your dog’s individual nutritional requirements. Then, the company mixes up a unique blend of kibbles, for a truly personalised batch of dog food. 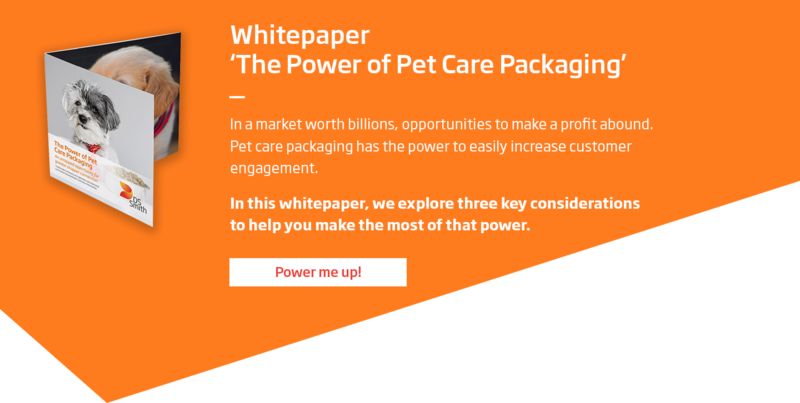 There are similar opportunities to use personalised packaging to tap into pet owners’ love of their pets, recognising that every animal is different and has its own needs and tastes. As the tendency towards more premium products is set to continue, there is a growing opportunity for packaging to demonstrate a deluxe offering. And as formats are changing too – like the aforementioned chilled pet food – shoppers won’t always know where to find certain items. Therefore, it has never been more important to ensure that your products stand out in store. Otherwise, time-poor shoppers may simply overlook these new categories. Consider using new types of advertising signage with a clear call to action, encouraging customers to visit the chilled pet food aisle. Similarly, for niche retailers, building awareness and driving traffic is vitally important. Targeting shoppers online or in proximity to store is the way to go. Brands need to consider how their communications in and around stores can work alongside packaging to aid discovery. Get emotional: recognise that pets are part of the family and factor this into your branding to influence shopper decision-making. De-risk the first purchase: offer trial samples to leverage positive product reviews. Make it personal: adapt pack design to recognise pets’ individual needs. Draw attention: use brand communications to direct shoppers to premium fixtures and niche retailers. Want more information on how to support your pet brand’s packaging? Get in touch with a packaging expert at DS Smith.